A book previously published within the framework of the Ecological Studies Series, entitled "Physical Aspects of Soil Water and Salts in Ecosystems" included awidespectrum of research papers devoted to new findings in the field of soil-plant-water relationships. "Arid Zone Irrigation" has been written specifically as a textbook for agronomists, soil scientists, agrometeorologists, water engineers and plant physiologists who want a clear presentation of irrigation fundamentals in arid and semi-arid zones. It was our intention to provide an understanding of the basic principles governing irrigation technology and to help overcome the problem of water shortage in arid zone agriculture. This book, written by a large number of specialists and covering a broad spectrum of different disciplines, is based on general up-to-date information, as well as on the results of the authors' own research. 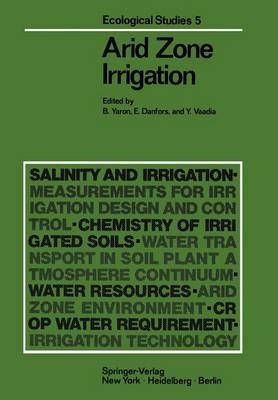 The idea of preparing such a textbook was conceived during a series of international advanced courses on irrigation held annually at the Institute of Soils and Water, Agricul- tural Research Organization, Volcani Center, Bet Dagan, Israel. The final organization of the material has been influenced by discussions with colleagues from Sweden and Holland and the participants in our summer courses. Grateful acknowledgements are due to Professor CALVIN C. ROSE, CSIRO, Canberra, Australia, Professor DALE SWARTZENDRUBER, Purdue University, Lafayetta, U.S.A., and Dr. SHLOMO P. NEUMAN, Agricultural Research Organization, Bet Dagan, Israel, for their many helpful suggestions during critical reading of the manuscript. We thank also Mrs.